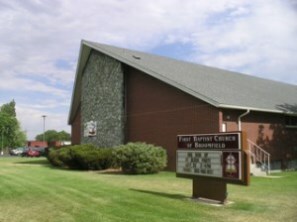 First Baptist, Broomfield began as a mission church of the Broadway Baptist Church in Boulder, CO, and was formally constituted on October 18, 1959, and on October 17th & 18th, 2009 we held a Jubilee Homecoming Celebration. Our beliefs are consistent with The Baptist Faith and Message as adopted by the Southern Baptist Convention on June 14, 2000. First Baptist Church of Broomfield offers a number of ministries to suit your needs: Bible Study, Children’s Ministry, Prayer, Senior Ministry, Team Ministry, Women’s Ministry & Ladies Bible Study, Youth Ministry and Sunday Worship. Your generous donation will allow us to continue our mission.